For Americans, today its Thanksgiving and although I’m Canadian I can’t pass up any opportunity that gives you the chance to say thanks. I always give thanks to God for my health and gratitude to all that he has blessed me with. I’m thankful to my family and friends (and that includes all my friends near and far). Thank you for making my life beautiful!! I also wanted to wish all my Jewish friends a Happy Chanukah!! Its the first day of Chanukah today. We celebrate the holiday of lights, the holiday of miracles. Chanukah reminds us that there are miracles in our lives every single day!! 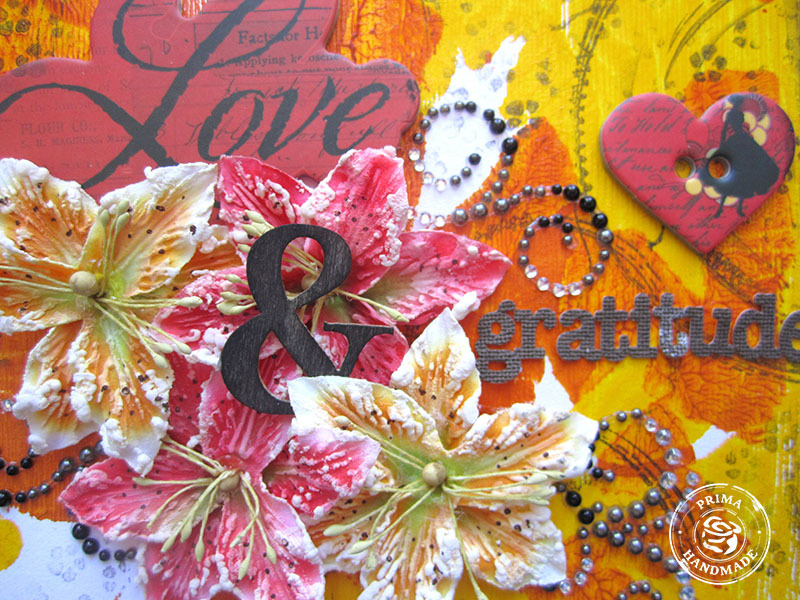 Here is the thanksgiving card I made for the Thanksgiving Feature at Prima. 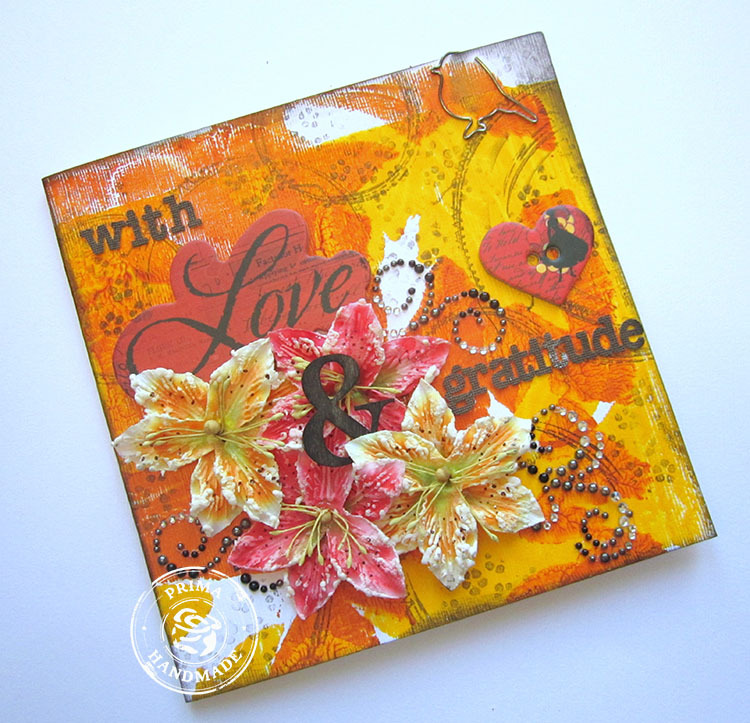 We were asked to use our Gelli-art plates to create the background of today’s Prima projects. 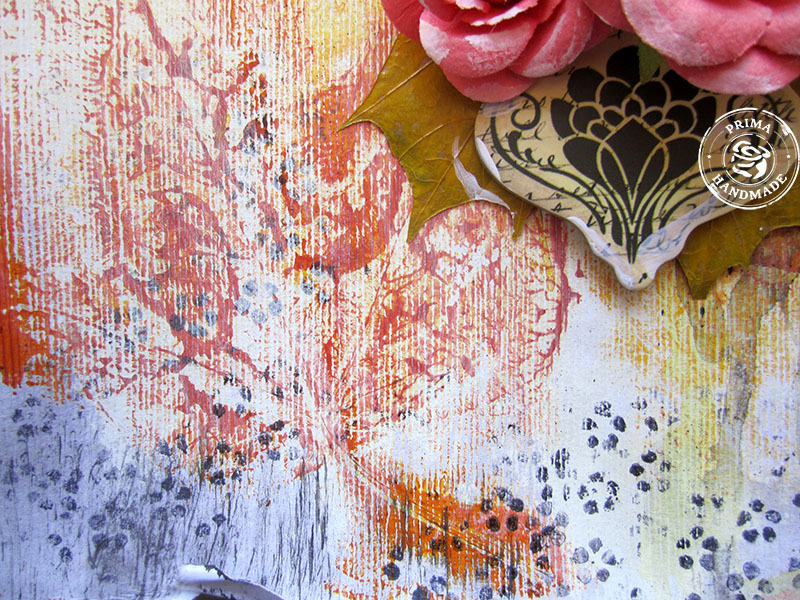 I used real leaves that I collected from the ground to mask atop the Gelli-art plate after I had added the paint. The first layer was yellow and I used maple leaves. Then I painted in orange and masked the other autumn leaves I had collected. This is a photo of my daughter taken recently while she was throwing leaves in the forest. I’m so grateful for happy moments like this one. She was so care free, throwing leaves into the cold crisp air. I just love the Ingvild Bolme embellishments. 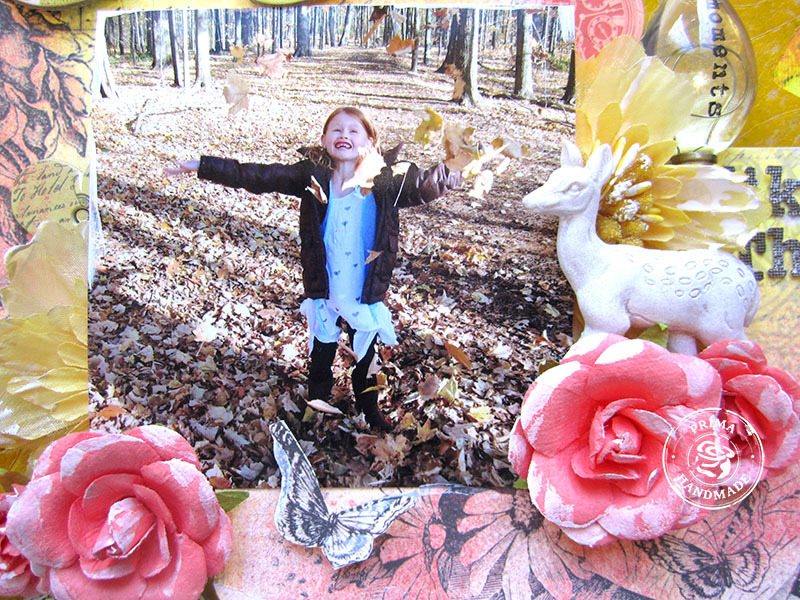 The little deer was perfect for this forest scene. 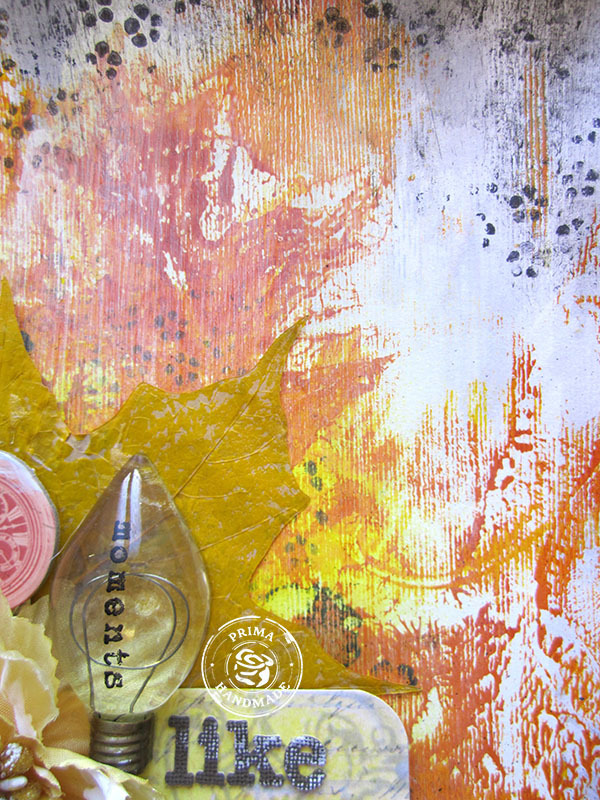 In these two photos you can see both the Gelli-art ghost imprint of the leaves and the actual leaf itself. Happy Chanukah and Happy thanksgiving!! These are gorgeous!! I love love love the colors and the flowers!!!! 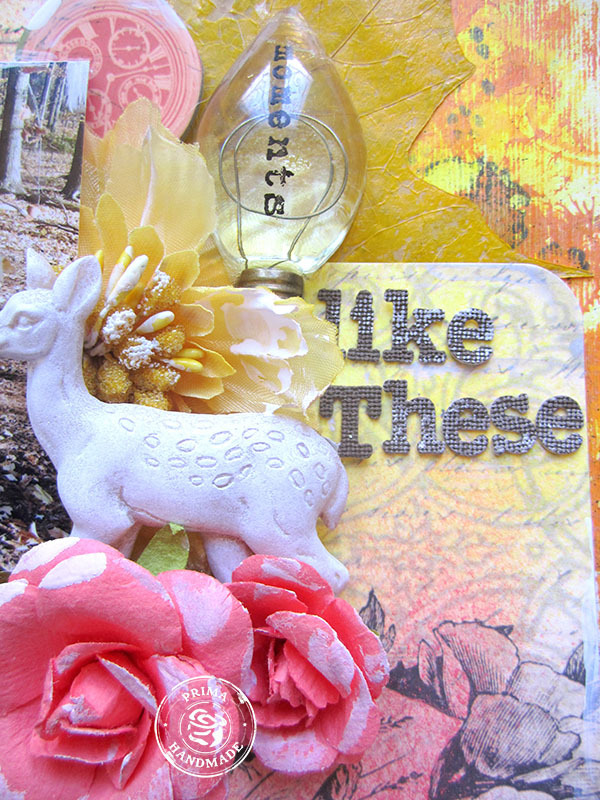 Hi Keren, love the beautiful textures and colors you have created in these gorgeous projects !! love that joyful pic of your daughter !! I can not decide which one is my favorite. Adore the colors on the card but the ghosted print is also absolutely amazing. Gorgeous fiery colours in the card and the LO – and what a fabulous picture for the theme!